You can “donate” the tabs you open in Chrome to a good cause of your choice. 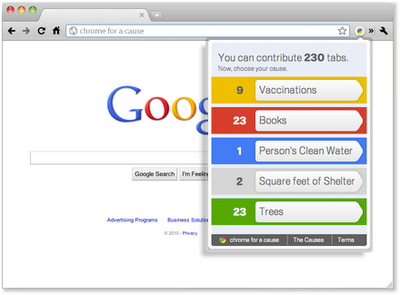 Install the Chrome for a Cause extension to participate. Each tab you open will raise money for charity. If you want to participate, you have to install the Chrome for Cause extension in your Chrome browser here.